Tiny, quiet mirrorless cameras now stand shoulder-to-shoulder with big digital SLRs for everything except focusing on moving targets. And they’re swiftly closing that gap too. So unless you’re shooting sports or children running indoors, mirrorless cameras are extremely tempting, especially for travel and landscape photography. You no longer have to lug tons of heavy gear to get great photos. Panasonic and Olympus mirrorless cameras can even swap lenses between the two brands, so they have the broadest range of lenses to choose from. All the mirrorless cameras record good video, particularly the Sonys and Panasonics. If you're a stickler for quality, Sony and Fuji have expensive models with superb picture quality that can easily produce billboards for professional work. Their quality is fully equal to digital SLRs even in dim light. If picture quality - not speed - is what you're after, have a look at the exceptional deal on the old model Fuji below. We’ve just added a mirrorless camera that you can try on our courses. If you’re pining for a camera with old-fashioned soul, they’re back. Olympus, Panasonic, Pentax, Nikon and especially Fuji are pushing retro-style cameras with levers and dials driving modern digital guts with more models being announced early 2016. They feel nice, and for me they evoke that simple, thoughtful pleasure of film photography again, and their quirks make me stop and look at the roses, rather than just sprint to a finished picture. You can control most new cameras wirelessly from your smartphone - seeing the picture on the phone before you shoot, changing the settings, shooting, and then getting the final picture on the phone. All without touching the camera. The great deals of this time last year are no longer, due to the hike in the Aussie dollar making it difficult to catch a bargain overseas and import. To try to make up for this, many of the major brands (Fuji, Canon, Nikon, Sony) are offering "cashback" to try and sweeten the deal. It's claimable after the fact but just make sure you check the terms or you might be waiting a lifetime to see the return of your hard earned dollar. Olympus E-PM2. AU$584 at Digital Camera Warehouse with 2 lenses. I saw this and bought one immediately to take on holiday. It’s a ‘micro-four-thirds mirrorless’ camera - just about as good as an SLR, only smaller. In 2012, the only camera with its excellent sensor cost AU$1,500 with one lens. It’s lightning-quick to focus (just touch the thing you want in focus on the screen) and super-easy to use - my kids play with it too. It shoots well in extremely dim light, and takes tiny interchangeable lenses that fit in your pocket. Drawbacks? The kit lenses are OK, but not great (but check-out the tiny 45mm f/1.8 lens for lovely portraits); there’s no viewfinder, the small battery only gives 350 shots, and it can’t track moving targets, so it’s not as good as an SLR for sports or kids running around indoors. Canon 55-250 f/4-5.6 lenses cheap at Kogan. If you want a long lens for portraits for a Canon SLR camera, these are good prices. The "USM" model ($170) focuses slightly faster, and is the best for stills photography. The "STM" model ($160) is better for video - it's fractionally slower at focusing, but it focuses silently and without jerks. 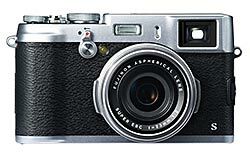 We were recommending the super-cheap Fuji XE-1 at Camera Pro, but they've put the price back up, making it far from a bargain now.